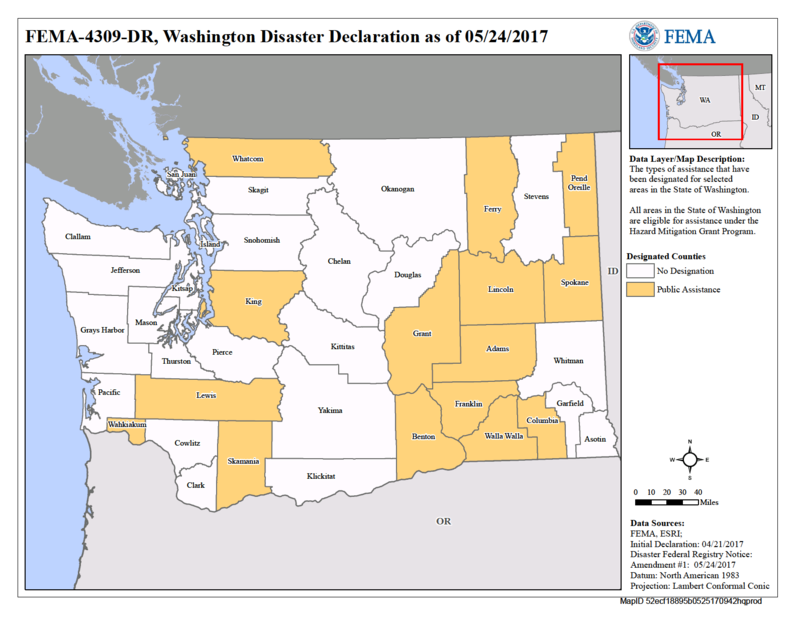 Federal funding is available to state, tribal, and eligible local governments and certain private nonprofit organizations on a cost-sharing basis for emergency work and the repair or replacement of facilities damaged by severe winter storms, flooding, landslides, and mudslides in Adams, Benton, Columbia, Franklin, Grant, Lewis, Lincoln, Pend Oreille, Skamania, Spokane, Wahkiakum, Walla Walla, and Whatcom counties. Federal funding is also available on a cost-sharing basis for hazard mitigation measures statewide. Learn about mold prevention and treatment from Washington's Department of Health. Get answers from Washington's Information Network by calling 2-1-1, an easy-to-remember phone number for people in Washington to call for health and human service information and referrals and other assistance to meet their needs. WIN211 maintains a statewide database of community resources. The National Flood Insurance Program aims to reduce the impact of flooding on private and public structures by providing affordable insurance to property owners. USDA Service Centers are designed to be a single location where customers can access the services provided by the Farm Service Agency, Natural Resources Conservation Service, and the Rural Development agencies. This web site provides the address of a USDA Service Center and other Agency offices serving your area along with information on how to contact them.